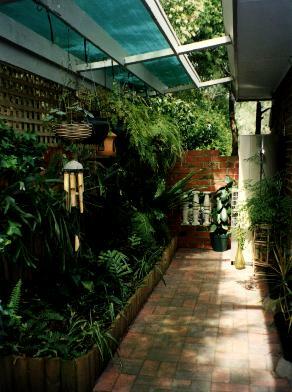 The kitchen fernery is cool and shady even on the hotest of days. I have a great love of ferns of all kinds even the giant Staghorn ferns that we inherated from previous owners of the Lawson Avenue property. There are also hanging baskets of bright fushias that seem to attract a great many butterflies. Looking out on the this scene makes standing at the kitchen sink washing dishes a much less tiresome chore.